Please contact me at enter@artgalleryhub.com to join the waiting list. Does anything on this page hinder or even irritate you? I would love to know. Nothing is unimportant, too small or too big. If there is something I can fix, I will certainly do it. Did another professional ever had a look at your gallery's site? Nothing more refreshing than to focus on your site from an unfamiliar perspective. We are all so embedded in our own professional environment that we are always boggled when an outsider stops by and starts bombarding us with 'Where...? ', 'How...?' and the sometimes truly embarrassing 'Why...?'. Businesses sometimes hire people from outside their environment to help them unblock product development issues, find out why a new service is a disaster or what detail could become a major competitive advantage. These people are able to look at problem from a distance and present a fresh look. They act like wild geese flying over, triggering unrest among the tame geese who want to join the migrating birds. It sometimes leads to hilarious situations. Engineers are invited to participate in discussion groups about a new beauty product, visual artists participate unblocking a technical issue... . Because they come from a completely different professional environment where other competencies are imposed, their opinions seem 'incompetent'. But it's precisely their unusual approach that helps to unblock a situation. Each professional knows the pitfalls in his own specialty and how to avoid them. With his vision on things and his competency he can, in a few questions, point out the features that should be built on more, an essential component that is simply missing or that tiny detail that you failed to notice so far. These 'scans' invite you to look at your gallery's site through the eyes of specialists who are not involved in web design, programming or content creation. 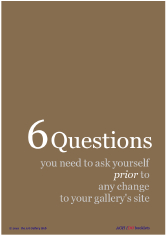 But if you would let them, they could fire off some "uneasy" questions about your gallery's site. Better be ahead of them. The web has its own rules and regulations. But even if the web is a virtual space, your site still has to comply with national and international legislation. One area that immediately comes to mind is the protection of your visitor's privacy. And what about your guarantees as owner of the site? Did you read the small print before signing up your service contract with your provider? 'Location, location, location' is the triple credo of any real estate agent. Did you pick the right 'location' for your gallery's site? Is your gallery's site ideally situated on the web? How do you manage your location? Or to start with: how do you manage the real estate of your web pages? You probably think that 'it' is unlikely to happen to your gallery's site. But servers go down, programs start acting weird and even the best providers face technical failures. What would happen if your gallery's site crashed? Or if your provider's server went down? Are you prepared? Do you have ... an emergency plan in place? ... a secure backup strategy? ... and a routine backup process tested and working? Too bad there are more Murphy's Laws than you can handle. P.S. Let's keep in touch via your suggestions, questions or remarks, shall we? © 2006-2019 - The Art Gallery Hub Limited. All rights reserved.